From a limited edition of 6, this artist book by Naomi S. Adams is about favorite wine and cheese pairings, and ultimately, relationships. Since the illustrations are hand drawn, it is an edition variee. While they are extremely similar, the illustrations make it impossible for each book to be exactly the same. I think it adds charm. This listing is for one book from my 6 book edition. The letterpress type in this book was created on a Vandercook Print Press at Texas Woman's University. I used some fabulous big metal type to create impressions on watercolor paper with hand torn edges. The illustrations are inked and then painted on top with watercolors. There are seven pairings in the book. 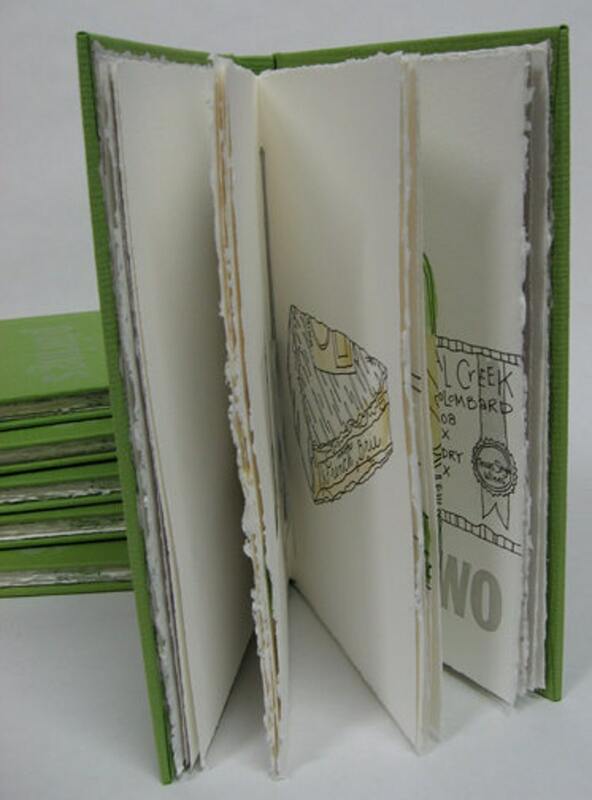 The book is 9 1/2" H x 6" W. The book has 20 pages and 14 hand drawn illustrations. Each pair is a wine and cheese that I love best together. I had to do some serious research. In this case, a lot of wine and cheese had to be consumed. It's a hard job, but someone has to do it. Although lighthearted in many ways, the book also poses my thoughts about pairings and how I feel our culture presents that we are better or more whole if we are coupled up with that special someone. Each pairing has their own phrase associated with this idea, such as "two peas in a pod" or "coupling". You see the wine and cheese together, overlaid through a window that showcases the matched set and both of their best qualities. When you turn the page, the cheese stands alone and the wine is left incomplete, with a hole in the bottle. This book was made with much care and love and each element was carefully selected by the artist, from the lovely papers to the hand drawn and watercolored images. It is sure to make you thirsty and hungry. If you are a resident of IDAHO, you will also need to pay sales tax of 6%. Shipping will include delivery confirmation so you can track your package! If you pay with a personal check, you will need to wait until the check clears for me to ship the item.